LOS ANGELES- April 12th, 2019- Yahoo! has called it the most sought after vinyl of 2019. 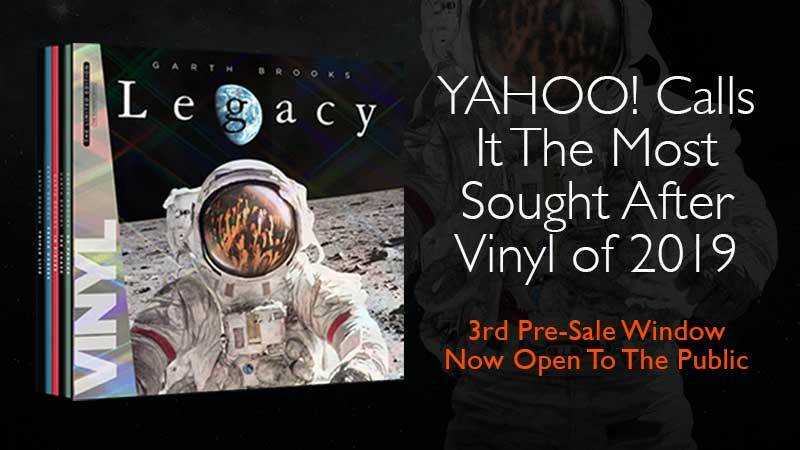 Just this week, AOL said, "Brooks proved his selling power during his first-ever vinyl collection's initial two pre-order windows: During the first 18-hour opening, he sold 420,000 vinyls and, during the second 24-hour period, he sold another 300,000. That brings his current total vinyl sales to 720,000 in less than 48 hours." Forbes noted, "to put this in context, The Beatles were the number-one vinyl artist in 2018 with 321,000 sales in over 12 months." This morning, Garth gave a personal tour of some of the awards associated with the albums that are on LEGACY. He also then surprised everyone by revealing he kept all the shirts and hats worn on his iconic album covers! He showed them all off and told the stories behind several of them. You can watch the video on the link above. In LEGACY, there are seven vinyl albums, with seven separate CDs of the same titles including bonus tracks not found on the vinyl. The albums are Triple Live, a three-disc set that brings his recent record-shattering tour with Trisha Yearwood to life, No Fences, The Chase, In Pieces and Fresh Horses. Dates are very important to Garth, so buying during the pre-sale allows fans to select the six-digit number that goes on the side of the box, making it very commemorative. The six-digit numbers that Garth has reserved are his wedding anniversary and the birthdays of his children.